Mintoline is made from the same nourishing ingredients as Vegaline, but with the cooling and herbal scent of fresh peppermint. Mintoline is made with simple, 100% natural ingredients – super nourishing and quick absorbing oil, wax, and 100% natural peppermint oil. Mintoline will help your skin feel soft all day long. 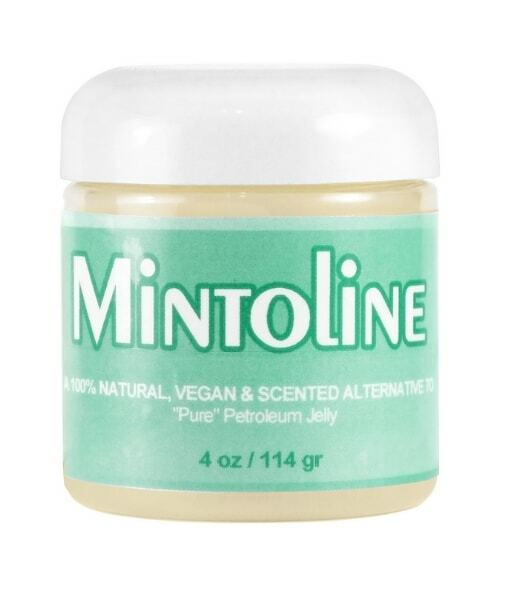 With properties that will keep skin feeling hydrated, Mintoline can be used for: moisturizing the face, keeping lips soft, styling and nourishing dry and brittle hair, keeping your body moisturized, removing makeup, priming your face, helping cracked and dry heels and feet, soothing delicate baby bottoms and everything else “Pure” Petroleum Jelly is used for! Beeseline Original is a mixture of 3 simple, 100% natural and certified organic ingredients. It is a 100% natural alternative to petroleum jelly. With an amazing technology of the use of “raw” vegetable oils and ingredients, Beeseline brings you the world’s best natural alternative to petroleum jelly that is credited for being hypo-allergenic and great on sensitive skin. Vegaline is the Vegan version of Beeseline, the same great moisturizer, without the beeswax or honey. Like “Pure” Petroleum Jelly, Beeseline/Vegaline is amazing for absolutley everything! Moisturizing skin everywhere, makeup primer and remover, skin soother, baby balm, lip balm, foot balm, great on dry noses, dry skin, adds healthy glow, eczema, toes, lubricator, hair styling, eyebrows, pets and so much more! 0.5 oz / 14 g – 4 oz / 114 g.
*Safflower Oil, Soy Wax, Candelilla Wax & *Peppermint Essential Oil. ( * = Certified Organic) *Safflower Oil, Soy Wax, Candelilla Wax & *Peppermint Essential Oil.